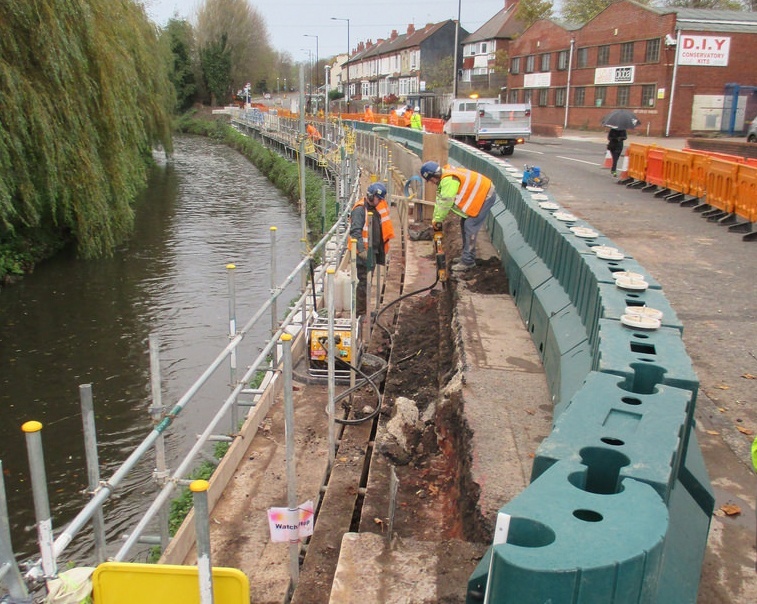 Jackson Civils who carry out construction work for The Environment Agency have used our 0.9m high Floodstop system to protect a 60-metre long section of flood wall in the Midlands whilst it is being upgraded. Floodstop is perfect as it offers a small footprint and can be left in place during the construction works to the riverside. It is self-standing, robust and offers proven flood protection whilst in place. Unlike other systems Floodstop flood barriers are very sturdy and it would be very difficult for vandals to damage the units when in place. Also the Floodstop system is self-contained, it doesn’t require any plastic sheeting overlay which can be easily pierced and be affected by strong winds. The cost of deploying Floodstop for the 60-metres lengths of protection was far less expensive than other methods. This includes comparison with building a large (ineffective) sandbag wall and other flood prevention systems. Unlike sandbagging Floodstop can be used time and time again – allowing further deployment at future construction sites for Jackson Civils. If you are looking for a system that can be deployed during civil works please contact us today for a hire or purchase quotation.